As promised here, chronologically, are the 3rd and 4th books to blog by in my year of the size15stylist blog. Virginia Woolf is one of those authors that had been on my To Read list for so many years, you know, a serious writer to name drop. I even had a few of her novels on my bookshelf, that I’d snapped up at charity shops over the years, to show my earnest intentions. 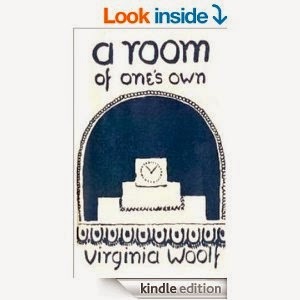 On one work commute I downloaded A Room of One's Own as it was a practical book about writing, instead of a novel. It was so absorbing I just read it in a day or so (no mean feat when you're a Mum and an employee). I was intrigued by her world, a very male-oriented environment, and the history she conveys (the book was based on a talk she was asked to give in 1928, a time when women had only had the right to vote for 10 years). I also liked the idea that a woman only needed a room of one’s own and a yearly income of £500 in order to write. Thanks to an online inflation calculator I reckoned that meant, last August, I needed a room of my own and a yearly income of £22,000. Well, I don’t earn anywhere near that (yet), and will barely pull in £500 a year from my first year of writing, but it was a pivotal moment to make me think beyond the nonsense of needing a bunch of 'stuff'...although I adore stationery shopping - Paperchase in September! 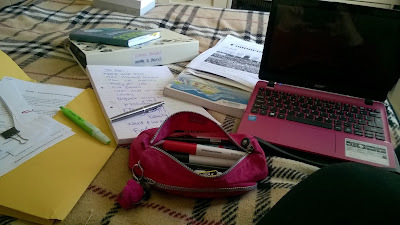 – it is a bit of a distraction from writing at times. After reading this book I took time to work out financially what I needed to do to be happy in the room of my own, and that became my saving goal. It also turns out that I write better on the sofa in front of a muted TV than I do in a spare room with all the writing implements I’ve gathered over the years! 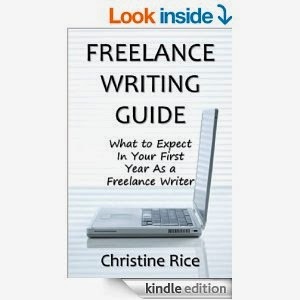 In my downloading frenzy last August, during one lunchbreak I downloaded a sample of Christine Rice's Freelance Writing Guide simply because Amazon directed me to it when I fired up the Kindle. After reading I liked the author's style and her practical tips on what to expect in your first year as a freelance writer - this book hit the magical Venn diagram position of 'desirable content' and 'affordable' so I bought the full version. Incidentally, the Kindle adverts have often directed me to a good read, so don’t let them put you off buying an e-reader with the option for adverts. Now I think about it I had probably been the kind of customer that kindle publishing author Steve Scott writes about in his book Is $.99 the New Free? - I am more likely to part with my money if the book is a) one that I want and b) as close to £2 as possible, and ideally under £3. Although Rice's book is currently selling at £3.28. Thankfully, I'm not a rule-follower. Join me towards the end of next week for details of books 5 and 6, and my post about the debate surrounding Britain's real second city: Manchester or Birmingham. Which do you prefer to shop in? I'm off to prepare the house for Bank Holiday visitors and then pack for next weekend's double-city shopping break, do let me know any 'finds' you have to share about either city!